The demand for housing is rising with numerous areas around the city boasting to be a residential paradise. 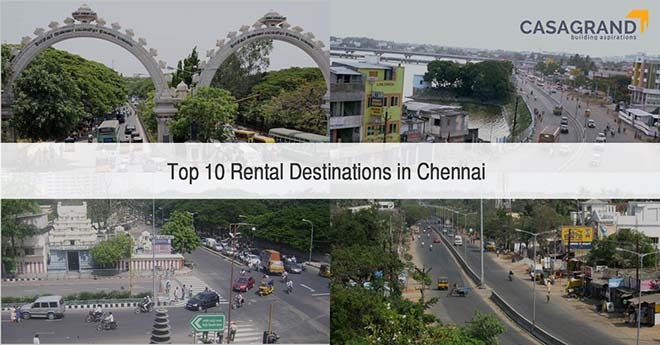 If you’re looking to take up a place for rent in the city, check out our list of the ten best rental destinations in Chennai. One of the up-and-coming areas of Chennai, OMR gives everything and more to IT professionals. The stretch also covers some of the prime areas of the city, opening up an opportunity for the real estate market. OMR is bundled with some of the city’s finest colleges and soon-to-be-launched a full A/C public transportation. While a tad on the expensive side, if you are eager to take up a place for rent, you will find decent pricing at Casagrand The Address. Neighboring OMR is Perungudi, which has been handpicked as the next best residential haven. Perungudi is expected to expand and modernize itself in the coming years. A fast growing real estate hotspot in Chennai, Alandur has a mixed bag of all the family-friendly essentials. With the prestigious Anna University only 6 km away and numerous restaurants to tease your taste buds on every corner, Alandur could make for a very delightful living experience. A gateway of South Chennai, Tambaram has become one of the busiest locations in the city. Home to the famous old Madras Christian College and Air Force station of the Indian Air Force, Tambaram is a decent lodging for students and those living independently. If you are willing to rent on a higher budget, Adyar is one of the best options available. One of the most popular locations in Chennai, Adyar is a proper residential haven with some prime hangout destinations like the nature hugging Theosophical society, with its beautiful flora and fauna, the Adyar Eco Park, known for its bird sanctuary and the Eliot Beach, near Besant Nagar, for all things recreational. The famous Adyar Ananda Bhavan sewed its roots here and is accompanied by popular sweet shop The Grand Sweets and Snacks, perfect for all your sweet tooth. Ask anyone in Chennai for a prime location and the first response you will get is Anna Nagar. The first and only area in the city to follow the standard addressing system, Anna Nagar is one of the city’s largest areas with an abundance of resources for everyday living. From famous schools like SBOA to over 14 high profile shops, the historic Anna Arch and the hip and happening Anna Nagar Tower, there are too many things to list here. You can experience it all with varying rental rates that go from affordable to really expensive. Chennai’s very own Hollywood Boulevard, Alwarpet is for you if you love being surrounded by glitz and glamor. The city’s most posh and upscale area, you’ll come across gorgeous villas and architecture that is a treat to the eyes. Famous personalities who live here include Kamal Haasan and Rajinikanth. Chief Minister Jayalalitha also resides here by Poes Garden. Ambattur is to industry what OMR is for IT. Expanded as the Ambattur Industrial Estate, the area is buzzing with family friendly residential complexes. Ambattur also has its share of IT sector back offices like the Ambit IT Park, opening up a plethora of opportunities for the job hunters. Famous companies like Murugappa and Shakar Ceilings have set up their headquarters here. Riddled with schools, colleges, temples and parks, Ambattur can make for a great home for rent. One of the oldest areas in Chennai, Porur is believed to be in existence since the Pallava Period. Since then, the area has gone under huge development to become a residential paradise for many religion people. With an abundance of temples, mosques and churches; Porur makes for a great festive location. Important landmarks include the renowned Ramachandra Medical College, the 1000-year-old Ramanatha Eswarar Temple and the city’s second Radar Station for Madras Airport Authority. Another area in the city well surrounded by prime locations, Sholinganallur gives its residents job opportunities in the IT sector with famous companies like Wipro, TCS and HCL having branches here. If you like clean streets with fantastic road-mapping and spacious housing, Sholinganallur has its doors open to you. With this list, we are hopeful your hunt for a great place to rent has been narrowed down.